Exclusions: Cash Back is not available on Best Buy gift cards, warranties, Laptops, Tablets, Desktops, Video Game Hardware (including Virtual Reality Hardware), Point of Sale Activation (POSA) Cards, Apple-branded Watches, Apple AirPods, services (including but not limited to Geek Squad services, etc. ), and transactions on third party (i.e. 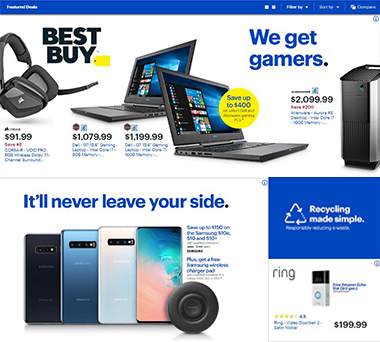 non-BestBuy.com) websites or properties, even if such transactions occurred as a result of a Customer clicking a link from a Best Buy Property. Cash Back is not available on Best Buy gift cards, warranties, Laptops, Tablets, Desktops, Video Game Hardware (including Virtual Reality Hardware), Point of Sale Activation (POSA) Cards, Apple-branded Watches, Apple AirPods, services (including but not limited to Geek Squad services, etc. ), and transactions on third party (i.e. non-BestBuy.com) websites or properties, even if such transactions occurred as a result of a Customer clicking a link from a Best Buy Property. Cash Back is not available on high volume/ reseller orders as defined by Best Buy.